In the post above you can see the Gold, Silver and Bronze medals as made for this edition of the WCO. 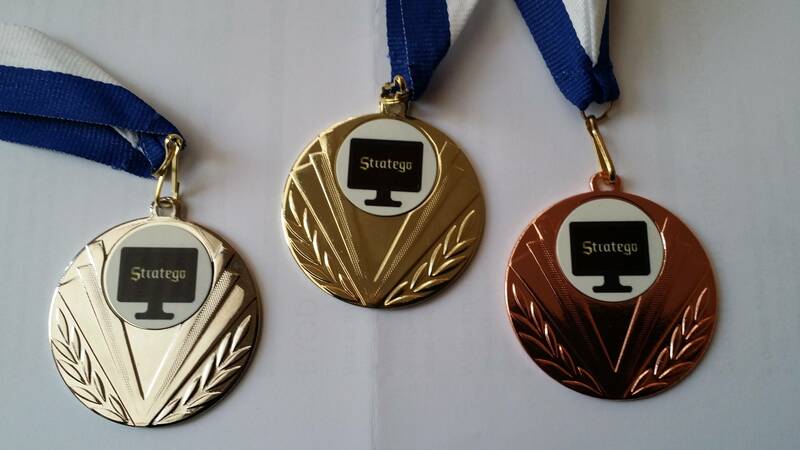 They are personalized with the account-names of the winners on the back and the text 2nd WC ONLINE STRATEGO 2016-2017. With the recap of Losermaker and his congratulations, we got the formal confirmation of the much anticipated game between him and Gkaros, 2nd WCO champion. From what i read it was an epic match that contained all elements that make Stratego one of the best board games of all times. Im very happy the tournament ended with such a game being played. Congratulations to Gkaros! Hielco managed to get his 2nd WCO medal by beating hello124, who probably played his best tournament so far. I am expecting to hear more of him and his brother in the future tournaments. I hope all the price winners and other players that participated in the WCO are considering to come to the real world championship this year. It is held in the country which currently has 2 Stratego world champions, Greece. It will be a great opportunity to play Stratego in the sun with a lot of the famous Stratego players, both real live and online. Wow that was an exciting end, congrats gkaros! And to hello124 who had such an amazing tournament. The true prodigy! I was shocked when in then mid game i had a java crush. Hopefully after disconnection i could join the game. The big problem was that i didnt have the number of pieces left. We came to draw situation (loosermaker informed me for the number of pieces). I frozed cause i needed win for championship. I denied 2 times the draw and took my chances after some minutes. I lotted a miner (many chances for pieces there) and prayed loosermaker take the scout (didnt know it) cause i had a miner behind the colo. When he did i thought the game was over but he had another piece near and sacrificed his major. We came to a situation 1colo 1 serg 1miner for me, 1 maj 1 serg 1miner for lm. I made a trick with serg (played as miner), looser lost the miner, game over. Second WCO after almost 5 months came in the end! 50 participants started , 44 finished all their games. New players in arena ,great battles , many surprises , and a fantastic end of this tournament. I congratulate you both on the game and Gkaros on his championship. It took a while in coming (as well in the game itself as in the long period beforehand). See you all next year in the championship! Wow what a game! Congrats gkaros, that was the best game I have had for quite some time, really good elements of all parts of the game in there. A recap for those interested. The game started fairly normal, neither giving much info. We were even at around 2 capts and 2 luits gone each and I knew a Maj and gkaros knew a col, eventually I took a risk with my col to take the major and get info, taking the major and finding the gen. After that gkaros got a capt and luit, but lost a major. We then swapped gens and a col, and I was forced to swap marsh's. It was now me up 2 majors vs gkaros colonel capt and luit up. I got back a luit with capt and major and took another capt with last hidden major before swapping majors. Now we are completely even in everything except majors and cols with are 2 majors for me and col for gkaros. The only other piece gkaros had up on me was a scout, soon to be a smiling scout . I blocked the lanes with my remaining 2 majors and capt, and we had no progress for some time, before gkaros swapped with his and my last capt. After the swap I brought out my last luit and got a miner, I was now ahead having 2 majors and 1 miner vs his col and other even pieces. Gkaros knew he had to do something so he took a calculated lotto and got a miner back before swapping luits. After that not much progress for some time until he forced me into a tricky position with his scout. He would let me have the scout but it would force my major down the lane (the side my flag is on) I was not sure to take it or not. End result is I shouldn't have, cause later it cost me my major to defend my flag when the miner came down. Now we are practically completely even, with gkaros having col miner and serg vs my major col and serg. I bluffed my miner for serg and was in a good position until his serg was forced to go near my miner, giving away the bluff and leading to the loss of my miner. I couldn't lotto the last miner in enough time to get out for a draw. The real game winner was the scout, without it I wouldn't have lost 2nd major. Just goes to show, you never know what piece is going to win you the game. Overall a great and very exciting game, very well done gkaros!